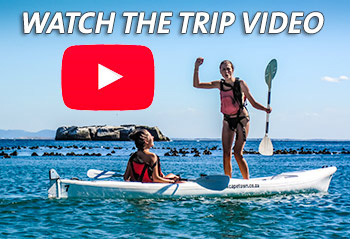 Take the guided tour on our very stable double kayaks and paddle the warm waters of False Bay and we'll show you some wonderful things on our visit to the penguins at Boulders Beach. No experience is required and any able bodied person can do it. We paddle every day of the year, weather permitting - summer and winter. The winter months are often wonderful for paddling because they have more calm windless days than summer and on those days it is absolutely beautiful. Plus there is always a chance of seeing whales. One of the most unique places in the world - a penguin colony in suburban Cape Town! And the best way to see it is from the water. We meet at the town jetty in Simon's Town for a short introduction to paddling technique and a safety briefing. We then paddle out past the civilian and Naval Harbour where you get a bonus close up view of our biggest naval vessels and out to Boulders Beach to see the penguins. On the way we will normally encounter a number of Cape Fur seals. If the time and tide is right we may stop on a beach for a swimming break, or else we swim from the kayaks and get a close up look at penguins on the rocks nearby. Our double kayaks are very stable and perfect for those with no paddling experience and children 10 and up. This is a trip every able bodied individual can and should do. During the whale season in winter and spring there is also a possibility of seeing these remarkable animals. The daily scheduled trip leaves at 8.30am in the summer season (9.00am winter season) when it is usually less windy. In peak summer season we also have an 11am trip, and sometimes an afternoon trip. The African Penguin is highly endangered and you can help to save them with a small donation to the volunteer run SANCCOB organisation, a registered non-profit whose primary objective is to reverse the decline of seabird populations through the rescue, rehabilitation and release of ill, injured, abandoned and oiled seabirds â€“ especially the African penguin. Click to help save a penguin. Once a month at Full Moon and only in April until October, when the weather is good, we can paddle out to sea and watch the splendour of full moon rising over the bay from behind the Hottentots Holland mountains. This is truly a unique experience and often books up very quickly. COST: R400pp for the 2 hour trip. It's a 45 to 60 minute drive from the centre of Cape Town. Take the M3 motorway from Cape Town (also called The Blue Route) to its end and turn right. In 2km at the second traffic light turn left up the mountain on the M64 "Ou Kaapse Weg". This 12km long mountain pass road has wonderful views through Silvermine and winds down to Sun Valley. Keep straight on past three traffic lights and over another hill you will reach a set of traffic lights at a T-junction by the ocean. Turn right and Simon's Town is 5kms away. Enter destination "Wharf Street Simon's Town" into your GPS. It may try to route you via Muizenberg, so it's best to use our directions as above via the M3, M64, M6 route until you get to Sun Valley and then follow the GPS. Trains leave regularly from Cape Town Station stopping at most local stations on the way and the trip takes an hour and five minutes. It is then a 10 minute walk to the launch site. Bear in mind it is not the most reliable service. About 700 metres past the Railway Station you will see the Shell petrol station on your right. Shortly after passing it you will see ahead of you on the left a blue and white building with a tall mast on it. Turn left into Wharf Street at this building. There is a parking lot just there and there are usually free spaces. Google Earth gives the co-ordinates as 34deg 11'33.94"S 18deg 25'56.80"E if you have a GPS with you.